How to watch GoodFellas (1990) on Netflix Switzerland! 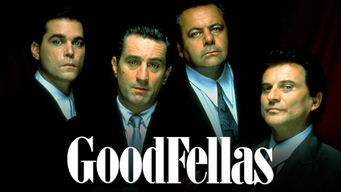 Sorry, GoodFellas is not available on Swiss Netflix, but you can unlock it right now in Switzerland and start watching! With a few simple steps you can change your Netflix region to a country like United Kingdom and start watching British Netflix, which includes GoodFellas. We'll keep checking Netflix Switzerland for GoodFellas, and this page will be updated with any changes. GoodFellas is not available in Switzerland BUT it can be unlocked and viewed! This definitive gangster saga follows the rise and fall of Henry Hill, whose criminal acumen caught the attention of top mobsters, and later the FBI. As far back as he could remember, he always wanted to be a gangster. But the wiseguy life comes at a steep price. There is a way to watch GoodFellas in Switzerland, even though it isn't currently available on Netflix locally. What you need is a system that lets you change your Netflix country. With a few simple steps you can be watching GoodFellas and thousands of other titles!